It's their most surprising red-state revival--and Barack Obama's happy dilemma. Obama campaigning in Austin during the Texas Democratic primary. “Did I mention that it’s fun to be a Democrat in Texas?” asks Matt Glazer, editor in chief of the Burnt Orange Report, the state’s leading progressive blog. He has, in fact, mentioned it a couple of times over beers at Scholz Garten, a legendary liberal hangout in Austin, and always with the same glimmer of happy bemusement behind his black-frame blogger specs. I’d been seeing that look in Democrats’ eyes all over Texas in early June–at their raucous, record-breaking state convention, at local Democratic shindigs, in giddily overburdened Obama HQs. “It’s like everyone who toiled on that Democratic death march for years, when it was so difficult, is now seeing daylight,” says Josh Berthume of the Dallas suburb Denton, editor in chief of TheTexasBlue.com and another key player in a vigorous blogosphere that has helped ignite the startling Democratic flare-up here, in the bright red heart of Tom DeLay and Karl Rove’s “permanent” Republican majority. The last Democratic presidential nominee to carry Texas was Jimmy Carter in 1976. The party hasn’t won a solitary statewide election since 1996. Every November from 1972 to 2004, the Democrats bled seats from their once-unanimous majority in the Statehouse. By the 1990s, national Democrats like Bill Clinton had come to see Texas as “a money pot, period,” says Molly Hanchey, a retiree who leads an 8,000-volunteer grassroots group called ObamaDallas. They flew in to raise cash, but they didn’t stick around to scare up votes–and Clinton’s party did nothing to help rebuild the state’s hopelessly antiquated Democratic infrastructure. Neither Al Gore nor John Kerry tried to compete here. By 2004, Democratic fortunes had sunk so low that they carried just eighteen of 254 Texas counties at the top of the ticket. What in the name of Sam Houston is going on down here? Pretty much the same partisan upheaval that’s roiling several of the Southern and Western states that became staunch Republican turf in the Reagan ’80s–and are now surprisingly tempting targets for Obama ’08. Even more powerfully than in Nevada, Colorado, New Mexico, North Carolina, Georgia and Virginia, a demographic tide is washing away the political dominance of older white conservatives in Texas, which in 2005 officially became the nation’s fourth “minority white” state (after California, New Mexico and Hawaii). At the same time, anti-immigration, ideologically rigid, starve-the-government Republican leaders are giving the GOP an ugly reputation with the rising generation of younger Hispanics–the swing voters who are displacing the old Reagan Democrats–and simultaneously alienating independent-minded, middle-aged “office populists” massing around booming metropolises like Dallas. Demographics and immigration aside, Texas wouldn’t be swinging so far so fast without a rejuvenated Democratic Party, which was hard to imagine just four years ago. Nowhere did Southern (or Western) Democrats fall so far in the 1980s and ’90s, and nowhere have they lifted themselves back up so quickly and dramatically. As The Return of the Democrats becomes the latest legend in the colorful book of Texas politics, many will date the beginning of the tale to 2003, when Democrats in the Legislature reconnected with their party’s hell-raising roots in the fight against DeLay’s Machiavellian (and legally dubious) redistricting scheme. By the time the redistricting fracas kicked up, Democrats had lost every significant vestige of power in Texas. Nearly forgotten were the many generations when “calling yourself a Democrat was like declaring you had a pulse,” in the words of former Lieutenant Governor Ben Barnes. “If you were alive, you were a Democrat.” But there was an ironic upside to the Democrats’ struggles: during its three decades of slow, steady decline, the party shed most of its white conservatives. While the loss of those Reagan Democrats meant short-term pain at the ballot box, it also gave Democrats a chance to remake their party practically from scratch (as Republicans did in the 1970s), with the state’s urban-centered, multiethnic future firmly in mind, and with a whole new set of high-tech, grassroots techniques and resources on hand, thanks in part to Howard Dean’s fifty-state national strategy. Elected in 2005, new party leaders like Dallas chair Darlene Ewing are reconstituting the historically disorganized party–in urban areas of the state, at least–into a precinct-by-precinct, voter-by-voter, high-tech machine. Angle’s Texas Democratic Trust, a Washington-based group funded by legendary trial attorney Fred Baron, the “Texas George Soros,” lent organizers and polling expertise to the “coordinated campaign” that took Dallas’s long-entrenched Republicans by surprise in 2006, and it’s providing similar aid to the Democrats’ takeover effort in Harris County this year. The GOP should have seen it coming in Dallas County, which lost 130,000 white residents–and gained more than 220,000 Hispanics–just between 2000 and 2006. In 2004 George W. Bush had carried the county by a scant 10,000 votes. But it wasn’t the population shift that turned Dallas blue in 2006; it was, in the words of local organizer Kirk McPike, the fact that local Democrats “took a good situation and made it extraordinary.” Ewing persuaded most of the Democratic judicial candidates in Dallas–there were more than forty–to contribute to the party’s new coordinated campaign and trust their prospects to a radically newfangled approach: a nonstop flurry of phone-banking, precinct-walking, direct-mailing and vote-targeting. Every judicial candidate won, as did Dallas’s first African-American district attorney, progressive Craig Watkins. “It was a triumph of grassroots politics,” says Angle. “Dallas Democrats spoke one-on-one to the voters, and more important, they communicated. It was research-based, targeted to things voters really cared about,” like the nation’s highest utility rates, statewide cuts in children’s healthcare and an unpopular Republican push for toll roads. Which brings us to the other indispensable contributor to the Democratic upsurge: Texas Republicans. Back at Scholz Garten, Burnt Orange blogger Karl-Thomas Musselman hoists his beer in a toast of sorts. “The best thing that ever happened to Democrats in Texas is that the people who took over the Republican Party in Texas are running it into the ground,” he says. Such delusional thinking has many GOP leaders–the ones currently out of power, at least–profoundly worried. “The grassroots has withered up and died,” former state chair Tom Pauken recently lamented in the Houston Chronicle. “The Republican Party has definitely peaked in Texas,” says the party’s longtime political director, Royal Masset. GOP pollster Mike Baselice fears big numbers of “grumpy Republicans”–more than 50 percent in Texas say the state and country are on the wrong track–will sit out 2008. Meanwhile, the party looks to be skidding toward a bloodbath in 2010, when insiders expect both Lieutenant Governor David Dewhurst, a hellfire-and-brimstone Christian conservative, and Senator Hutchison, who embodies the politer, Chamber of Commerce wing of the party (and says she’s tired of Washington and wants to come home), to challenge Perry in the Republican primary. “And people say Democrats have circular firing squads!” says Glazer, clearly charmed by the prospect. Rank-and-file Republican disquiet was all too palpable at the party’s state convention in Houston in June. Enthusiasm for the GOP’s presidential nominee-to-be was so damp that a local reporter counted the applause that followed John McCain’s campaign video at precisely eight seconds. Charisma-challenged Senator Cornyn, running for re-election in a state where a 2007 poll showed that 40 percent of voters had no opinion of him at all, unveiled an unintentionally uproarious video set to the old novelty hit “Big Bad John,” depicting the go-along senator as a take-no-prisoners, Stetson-hatted reformer making corrupt Washington politicians quake in their boots. Some of the weekend’s loudest cheers were spontaneous, off-the-agenda outbursts by supporters of rebellious Republican Congressman Ron Paul. For his part, Paul was one of an embarrassing fourteen no-shows–out of nineteen Congress members–who were being introduced at the convention. The Democratic resurrection in Texas could hardly be happier news for the national party’s long-term future. But in the short-term calculus of a presidential election year, it does create a dilemma–albeit a rather pleasant one–for Barack Obama’s campaign. On the one hand, Texas Democrats stand to gain more ground in local and legislative elections in November, and they could surely make good use of the rocket-boost of grassroots energy and big money that is Obama’s to spread around. Those investments, in turn, would build momentum for a quicker statewide turnaround–meaning, among other things, more members of Congress to bulk up the majority behind Obama’s policies. Down the road, of course, it would also bring the Democrats closer to a potential mother lode of electoral votes–thirty-four at present, with more than forty projected by 2030–that could make national contests vexingly difficult for Republicans to win. On the other hand, there is no realistic prospect that, barring a national landslide, Obama can carry Texas–until 2012, perhaps. And while Texas Democrats have a progressive, attractive Senate challenger in Rick Noriega, he’s struggling to rustle up the big bucks he needs against the well-heeled Cornyn. Besides, no matter how financially fat the Obama organization might be, running a full-scale campaign on Texas’ vast landscape of media markets is dauntingly expensive, with candidates needing to fork over some $1.4 million per week from Labor Day forward to get sufficient advertising on the air statewide. That adds up to a minimum of more than $11 million–money that might pay more immediate dividends in North Carolina, Nevada, Virginia, Colorado or New Mexico, toss-up states where Democratic turnarounds are further advanced. In the consultant-driven, micro-targeting days of the not-so-distant Democratic past, the Texas dilemma would have been solved easily enough: look at the polls–screw it!–shovel everything into Florida and Ohio! As former DNC chair Terry McAuliffe reportedly declared in a strategy session during the Gore campaign, “All we care about is getting to 270”–electoral votes, that is. Winning the White House, in turn, was supposed to be a magic bullet for building the party nationally–though Democrats in states like Texas reaped no benefits from President Clinton’s two wins. Just how much help Texas will be getting–“As in every presidential election, some states will be more competitive than others, and we will scale our resources accordingly,” Hildebrand carefully added–is anything but certain at this point. But Obama’s campaign guru, David Axelrod, promised in a series of Texas fundraisers in early June that fifteen staffers would be dispatched to Texas for the general election. 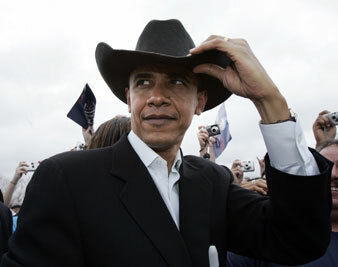 “He was cagey about their level of investment,” says Molly Hanchey, the ObamaDallas chair. “But he was clear that we won’t be just an ATM this time.” And that’s more important, she says, than making Texas a full-scale presidential battleground in November.